Our top 3 sets were juggled, jostled and reordered in draft form up until the last moment. I would have zero argument with someone stating that the Earthshatterer is the single best looking set in the game. I took no points off for the name which is bad use of the English language at best but who can argue with those shoulders as they literally look as though they are supporting dual Suns (or Stars for those science nerds among us)? It is also important to note that this set, along with all tier 3 items are no longer available in game. 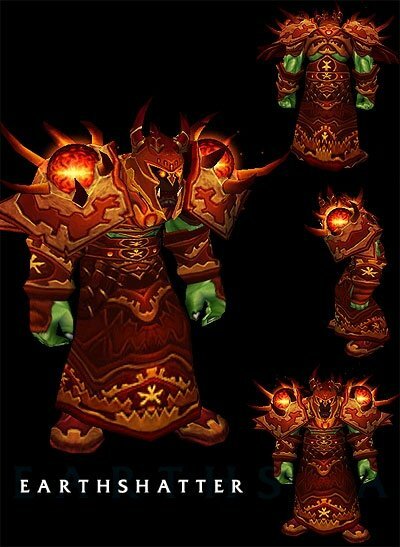 It is my profound hope that the new Darkmoon Faire coming in patch 4.3 will reintroduce the entire catalog of tier 3 sets back into the wild. If I had to make an argument in support of it not being at number 1 or 2, it would be that the rest of the pieces, while good are not at the same level of sheer awesome as the shoulders. While this set sits at number 3, it would probably be the first set I would hunt down were the set available in game. This entry was posted on September 5, 2011 at 3:13 pm and is filed under General, HFL, Podcast, Raiding, Role Playing, World of Warcraft. You can follow any responses to this entry through the RSS 2.0 feed. You can leave a response, or trackback from your own site.